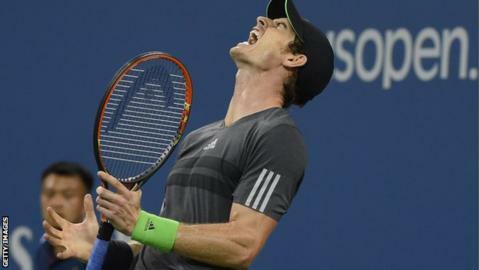 Andy Murray must take heart from the aggressive tactics that troubled Novak Djokovic in their US Open quarter-final, says seven-time Grand Slam champion Mats Wilander. The British number one lost in four sets over three-and-a-half hours, admitting afterwards that Djokovic had been "physically stronger", but for a period in the second set it was the Murray forehand that dominated. Huge, flat strikes deep into the corners had even the elastic Djokovic scrambling in vain to recover, and Murray finished the match with 20 forehand winners to eight on his backhand side. However, the exertion of hauling himself level at one set all, after more than two hours, took its toll as Djokovic won the third and fourth in little over an hour. Murray's Grand Slam season is over and, three weeks short of a year since he underwent back surgery, he remains without a title anywhere and ranked ninth in the world. "I think physically he's going to get stronger and stronger," said Wilander. "I think mentally it's a matter of deciding which way is he going to go. "Is he going to try and protect what he has and try and get back in the top four, top five in the world, possibly winning another Grand Slam? "Or is he going to do what he did against Djokovic and play more aggressively, and maybe have to take a loss or two, but also then feel like he can raise his game and threaten the best players. "He's still playing a little bit like he did before he won his first Grand Slam, which is maybe a little too far back and too defensively. Apart from last night against Djokovic." Darren Cahill, former coach to Andre Agassi and a regular confidante of Murray's in recent years, also saw signs of the player who won Grand Slam titles and Olympic gold. "You have to cast your mind back to 14, 15 months ago when he won Wimbledon and he was playing power tennis, he was moving beautifully, it felt like he could play for five hours," said the Australian. "I thought he was coming to the net extremely well. At the moment he's sort of drifting in and out of that tennis. It's just not sustained for long periods of time like it was 15 months ago. "It's much better than it was in January, and I'm sure in November it's going to be better than it is now." Murray's most successful period came under the guidance of Ivan Lendl, but it is Amelie Mauresmo who must now help the Scot find a way back to winning titles. He spoke earlier in the summer about employing more variety in his game, although on the US hard courts it has often appeared more like the "drifting" that Cahill describes. A serve that averaged a mighty 125mph proved too much for Jo-Wilfried Tsonga in the early stages of their fourth-round match, yet for the tournament as a whole his first serves were at 109mph, and his second serve a very tame 83mph. "He hits a serve 125mph and suddenly hits a 90-95mph first serve, so it was pretty unpredictable," said Djokovic after Wednesday's match. Only Roger Federer and Milos Raonic have been to the net more than Murray in New York, and the Briton had a better conversion rate than both of them, but against Djokovic he made fewer moves into the forecourt. That might have something to do with quality of the Serb's passing shots, but it was notable that Djokovic was prepared to take the initiative and serve-volley on break point at one stage. "In such a close match, you're not going to win it by staying back and getting balls back in the court," added Djokovic. "You are going to win it by pressuring your opponent, by hitting angles, by coming to the net." To play attacking tennis for any length of time requires the kind of athleticism that seemingly comes naturally to Roger Federer, but is a fragile possession for most athletes. Murray's work ethic is beyond doubt and he was among the first in tennis to create a team of specialist support staff, with whom he commits to regular punishing training blocks in Florida. But at the age of 27, and after what former Wimbledon champion Richard Krajicek describes as "really bad surgery", fitness could well be a constant factor for the rest of his career. "Ideally you should be able to go longer than this without feeling the effects," said John McEnroe on ESPN as Wednesday night's match unfolded. "I'm disappointed because I'm seeing a guy who has had to battle a lot of different things the last 15 months. "This is a problem he thought he had solved and now it will be in his head. It might affect him going forward." Murray's fitness is a major talking point but on closer examination it may be his tactics that are the issue. The data shows Murray ran further, a lot further, than his peers in New York. Federer is running an average of 9.25m per point, Djokovic 9.83m and Murray 11.20m. You want to know why he is getting tired? It's hard to go past those numbers. As Murray fatigues from running further each point, it has a clear effect on his serve speed. From the first set to the last set that Djokovic plays in a match, his average first-serve speed actually increases by 3%. Murray's serve speed, on the other hand, averaged a massive drop of 8.2% in New York. For example, in his first-round against Robin Haase, he averaged 111mph in set one. By set four that had drastically dropped to only 93mph. For a tantalising half hour or so, Murray managed what few others have as he bullied Djokovic. However, he went into the match having spent three-and-a-half hours longer on court than the Serb. To outmuscle the world number one over three or four hours might be unrealistic, but had Murray managed something similar against lesser opponents in the early rounds there might have been more in the tank as he tried to stay with Djokovic. As the contest headed into the early hours, Murray's service speed dipped, the trips to the net dried up and the number of shorter points he was able to win decreased. "You need to be patient, you need to practise, you need to stick with pain in those kind of matches," said former Wimbledon champion Goran Ivanisevic. "You could see after two sets he could not cope any more with Djokovic, he was just slower and slower, and Djokovic was just a better player. "He needs to practise, work hard and for sure he's going to come back and be the same Andy like last year, two years ago." "Murray plans to take a couple of weeks off before heading to Asia in search of a first title of the season and the all important ranking points required to qualify for the ATP World Tour Finals. He will take advantage of one of the wildcards which will be made available to him in either Beijing or Tokyo at the end of the month, before playing the Masters Series events in Shanghai and Paris. He is likely to slip to 10th place in the ATP Race for London, and may well need to reach the final of one of those Masters events if he's to take one of the eight spots at the O2. If he doesn't make it, there's a risk of losing some of the momentum built up here in New York." Murray has always put his faith in the practice court after significant defeats, and there are likely to be more hard sessions ahead than ever if he is to get back to Grand Slam winning ways. "You have to go with the evolution of your personality, what you want to do on the tennis court," said Wilander. "I think for Andy Murray it's probably being more aggressive, but day in and day out."